The Witcher 3 is the culmination of a whole lot of story, so players might need to be reminded of a few plotlines. It's not easy to write a good story for an RPG, let alone a saga spanning three massive games' worth of content. The overarching plot of The Witcher is coming to a close in The Witcher 3: Wild Hunt, so there are some loose ends to tie up from the first two games. The only problem is that the first Witcher came out way back in 2007, and it's getting hard to remember what Geralt was up to in those days. CD Projekt Red's solution comes in the form of an animated, narrated storybook that reminds players about Geralt's adventures. Choice has always been an important part of The Witcher, and like Mass Effect, Geralt's actions in the past could have consequences in Wild Hunt. When those situations arise, CD Projekt Red may hit the player with an animated flashback to the decision that set those events in motion. It's not the most elegant solution, but with the size of The Witcher 3 (which the developers claim will be 35 times the size of The Witcher 2: Assassins of Kings), it might be necessary. Between the flashbacks and narrated storybooks, The Witcher 3 looks like it'll have plenty of ties to the older games to give longtime fans a return on their emotional investment. 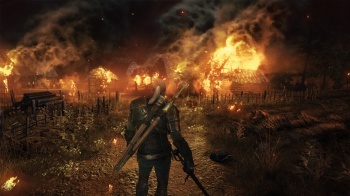 Look for The Witcher 3: Wild Hunt when it launches in 2014. But maybe skim the series' Wikipedia page first.